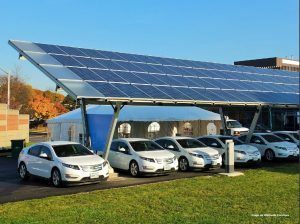 A recent UK study has assessed the current status of technological developments that have dramatically lowered the costs of solar PV and electric vehicles (EVs). As a result, solar PV could supply 23% of global power in 2040 and 29% by 2050. EVs can account for about 35% of the road transport market by 2035 and about 66% by 2050. With such significant strides forward, Solar PV and EVs are on the brink of replacing fossil fuels. As a result it is no longer useful to talk about peaking supply of fossil fuels but rather peaking demand. It is estimated that demand for coal will peak over the next several years, oil by 2020, and gas demand will be curtailed to about a 1% market share. With these transformative changes, global average temperature can be limited to 2.4°C with a 50% probability, and 2.7°C with a 66% probability by 2100. With additional policy advances and reduced carbon from sectors other than solar PV and EVs, it would be possible to hold global warming to 2°C. 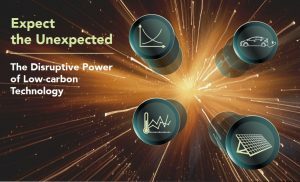 The study is Expect the Unexpected: The Disruptive Power of Low-carbon Technology (February 2017) by Carbon Tracker and Grantham Institute at Imperial College London. Like the Intergovernmental Panel on Climate Change, the Report constructs a series of scenarios to reflect certain assumptions and possible to probable outcomes. The first factor considered is the current and projected costs of solar photovoltaics (PV), including associated energy storage cost (at 0.25GW storage for each GW of solar PV power), and of electric vehicles (EVs). The authors used cost estimates for 2012-14 as well as scenarios with lower costs based on the latest available data and future falling costs. The authors also evaluated several variables reflecting global climate policies using a range of carbon prices to quantify and differentiate these efforts. Finally, the Report assessed three levels of energy demand based on population levels of 9.4 billion people in 2070, falling to 9.0 billion in 2100, and an average economic growth of 3.13% from 2010 to 2050. Then the authors used a higher and lower growth rate to reflect variable energy demand levels. The rapidly falling cost of solar PV modules is remarkable. Since 1976, the costs have fallen 99%. Such cost savings account in part for the growth in renewable power generation for which solar PV is a significant part. Until recently the savings have been in solar modules but non-module costs, such as cabling inverters and installation, are now also dropping. In fact, the continuing decline in the costs of solar PV makes it difficult to predict what future prices, and further savings, will be like. Some have estimated utility scale solar power at $390m/GW by 2050, but more recent projections indicate a price of less than $250m/GW by 2050. These cost reductions will result in a significant gain in market share for solar PV, at the expense of fossil fuels. The Report shows that by 2030 solar PV will account for 10% of global power generation when coupled with a strong climate policy. By 2050, the solar PV share will grow to 29%, even if a weak climate policy is in effect. The authors note that they have not taken into account any subsidies or preferential policies for solar PV in their calculations. At 15. Such factors would enhance the value of solar PV generally. In many countries, EVs remain a small percentage of new vehicles; in others they constitute a growing share of the market. And that market share will continue to grow, in large part because of the falling costs of EV lithium-ion and other batteries, as well as government incentives and consumer preferences. By 2015, there were over one million EVs globally, in contrast to hundreds just ten years earlier. 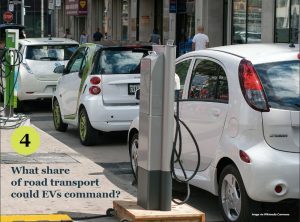 In the Netherlands EVs constitute a 10% share of the market, while in Norway they have a 23% share. Battery costs have fallen 73%, from $1,000/kWh in 2008 to $268/kWh in 2015. General Motors claims that its battery costs have fallen to $145/kWh since 2015, and Tesla claims that batteries will fall in price to $100/kWh by 2020. With the falling price of batteries, and with additional research and development on EVs, and strong investment, the capital costs of EVs will cost the same as internal combustion engine (ICE) vehicles by 2020. Indeed, Volkswagen claims its EV I.D. will be launched in 2020 at a price comparable to its Golf. See Archer in Sources below. In addition to the falling price of EV batteries, there is a growing expansion of charge stations that will reduce or eliminate “range anxiety” (the car running out of power before you get to where you’re going). Nissan estimates that by 2020 public electric charging stations will outnumber gas stations in the UK. See Murray, The Guardian in Sources below. And VW claims its new I.D. will have a range of 400 km. With these technological developments and cost efficiencies, the authors anticipate that EVs will account for about 35% of the road transport sector by 2035, and about 66% by 2050. At that time there will be more EVs than ICE vehicles on the road. The report does not factor in more dense cities across the globe that will expand mobility solutions such as car pooling and sharing, and autonomous vehicles. All these developments will enhance the position of EVs in the car market. These developments signal a dramatic turn that spells serious problems for the fossil fuel industry. The Report no longer talks about the supply of fossil fuel peaking, but the demand peaking. Depending on energy demand and energy policies, lower solar PV and EV costs will lead to a peak in demand for coal by 2020 and by 2050 coal demand will be 50% lower than in 2012. Demand for oil will peak in 2020, and from 2030 to 2050 it will fall steadily. Even natural gas, which some see as a transition fossil fuel, will decline in demand as solar PVs and EVs become cheaper. The fossil fuel industry remains dismissive of such threats to their bottom lines. They continue to argue that renewable energy sources are too unreliable and that the world will need fossil fuels for a long time. For example, ExxonMobil estimates that all renewables will account for only 11% of global power generation by 2040. In sharp contrast the authors explain how solar PV alone will account for 29% by 2050. One of the implications of the findings in the report affects the use of a business-as-usual (BAU) scenario for energy plans. 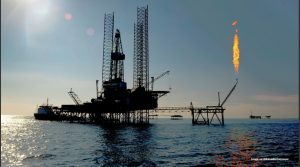 The industry argues that BAU is one option that relies on continued use of fossil fuels, which justifies more exploration, drilling and extraction of fossil fuels for generating energy, and driving vehicles. The rapid advance of solar PV and EVs, and other renewables, makes the fossil fuel industry use of a BAU scenario inappropriate, if not deceptive for investors. If renewable sources of energy are on the cusp of replacing fossil fuels, then fossil fuel companies, which rely on energy reserves for their valuation, become a risky investment. Fossil fuel companies owe it to the investing public to acknowledge such a development. Or public prosecutors need to assure that the fossil fuel companies do not deceive public investors. There are many economic and socio-political challenges remaining before solar PV and EVs dominate their respective markets. And there will remain a stubborn, heavily financed, opposition from the fossil fuel companies. But the hand-writing on the wall seems fairly legible: solar PV and EVs in particular, and renewables in general, are inevitably going to replace fossil fuels, in large measure or entirely, sooner rather than later. Cheaper, cleaner, just-as-reliable renewable power will replace more expensive, dirty, reliable fossil fuel. Be careful which stocks you buy. David Roberts, “2 remarkable facts that illustrate solar power’s declining cost,” Vox (3 February 2017). “UK electric vehicle boom drives new car sales to 12-year high,” The Guardian (6 Feb 2017).